Giveaway: Enter To Win An ROE Pass For Steven Soderbergh's 'Logan Lucky'! 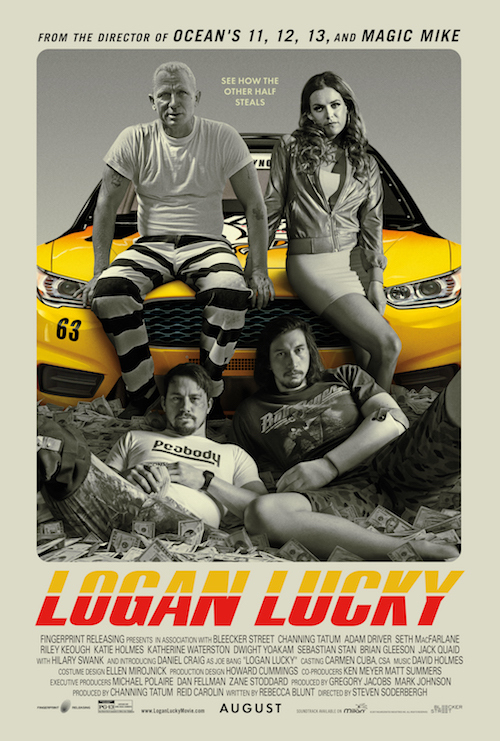 We're happy to offer our DC readers the chance to win one of five Admit-Two run of engagement (ROE) passes for Steven Soderbergh's return to the big screen with Logan Lucky! The film stars Channing Tatum, Daniel Craig, Adam Driver, Riley Keough, Katie Holmes, Seth MacFarlane, Sebastian Stan, and Katherine Waterston. SYNOPSIS: Trying to reverse a family curse, brothers Jimmy (Channing Tatum) and Clyde Logan (Adam Driver) set out to execute an elaborate robbery during the legendary Coca-Cola 600 race at the Charlotte Motor Speedway. The production shot at Charlotte Motor Speedway during the actual NASCAR Coca-Cola 600 and the Bank of America 500, as well as at Atlanta Motor Speedway. In a fun twist, six NASCAR stars pop up in non-driver cameo roles in the film. These ROE passes are valid beginning Monday, August 21st from Mon-Thurs at Landmark Atlantic Plumbing or Landmark Bethesda Row, through the film's theatrical engagement. If you'd like a chance to win, simply send an email to punchdrunktrav@gmail.com with 'LOGAN LUCKY ROE' in the subject line. Please include your full name and mailing address so we can send the passes if you win! Winners will be chosen on Monday, August 14th and notified by email. Good luck!